If you have a patient with hearing loss that would benefit from Hamilton® CapTel®, it’s never been easier to order a no-cost1 Hamilton CapTel Phone. If you have any questions, please call 800-826-7111 or send e-mail to hhc@hamiltoncaptel.com. Or provide your patient with a pre-printed form. If you’d like to order pre-printed forms, please call 800-826-7111. Complete the form in its entirety. This requires your patient’s information and signature, as well as the signature of a Physician, Audiologist or Hearing Related Professional verifying your patient has a qualified hearing loss. 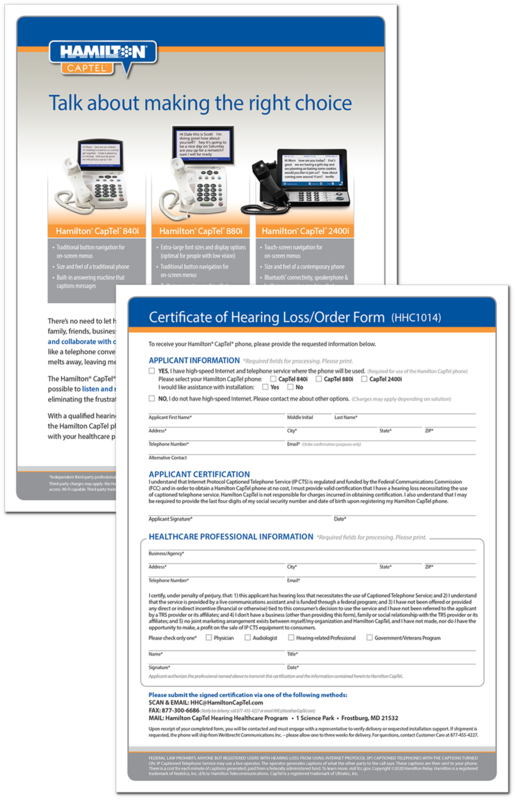 Submit the signed Certificate of Hearing Loss/Order Form as directed. Delivery typically takes 1-3 weeks. For quicker processing, complete the form online!